Some ideas for cards I'll think of and put them in cue, others go straight to the front of the line. Dwayne "The Rock" Johnson college football cards were made pretty much on inception. 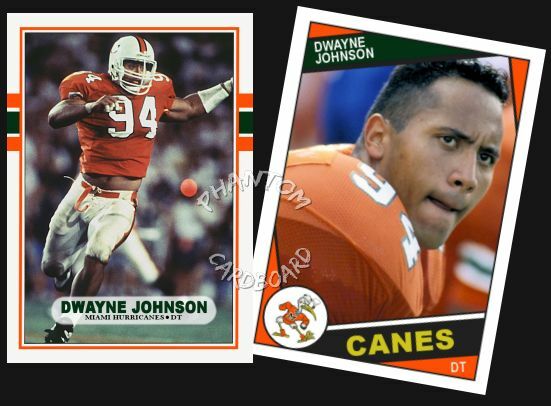 I ran across some pictures from The Rock's days at "The U" and thought they'd make great cards. In case you were not aware, Dwayne Johnson played defensive tackle for the University of Miami from 1991 (National Champions) - 1994. In 1995 he made the roster of the CFL's Calagary Stampede, but was cut from the team two month's later, which in turn led to his wrestling career. I only have a few football templates made, but all though not year accurate to Johnson's football career, I thought the 1984 Topps and 1989 Topps designs went perfect. The '84 looks great with the Hurricanes colors and I was especially stoked to use Miami's ibis mascot logo. I love cartoon character logo's and Miami's is one of my all-time favorites. These went out in the mail. Obviously it would be huge to get them back signed as Dwayne has become arguably the biggest movie star on the planet, but even unsigned I love the way these came out. I've seen a couple other Johnson fan-made cards; these are top-notch.